I ran across this idea a really long time ago and filed it into the back of my mind for a someday-I-must-make-this-because-my-babies-are-only-small-for-a-short-time-and-I-must-savor-their-smallness-type project. I was originally going to say pre-Pinterest, but perhaps not (though I couldn't find it among my pins . . . possibly because I have eleventy-billion). Ack! We are a family of FIVE!! I'm thinking about painting the hoop just to help it pop off the wall a bit more (I took this picture outside because the lighting where it normally hangs inside is atrocious), but that's a project for another day. And I'm sure I'll be content with it as is for now. The kids got a big kick out of this one . . . especially Kee-ku who continually runs past it and yells out "HANDS!" and then continues on like a tornado of toddler happiness. 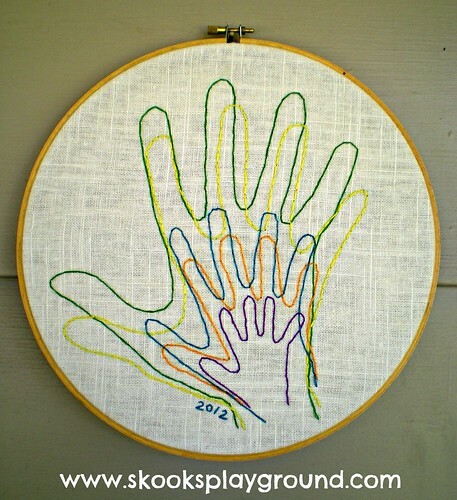 A little tip if you ever decide to do this project yourself: trace and then sew one hand at a time. I tried to trace 'em all first and wowzers . . . I started going a little cross-eyed there for a bit. I actually had to wash off my lines after doing a few hands and go one at a time because it was making me mental, and I kept stitching around the wrong lines. Which was making my hands look all crazy-like. And not always human. Anyway, I don't recommend that method. Do as I say, not as I do. And all that jazz. What? Jazz Hands? Sorry . . . super weird ending to a post.